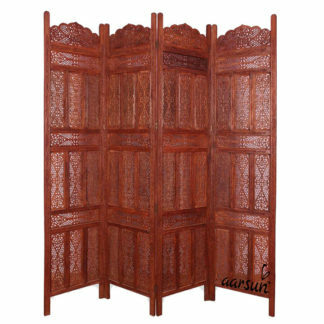 Aarsun Woods bring you this Handmade Folding Partition Screen / Room Divider made from Mango Wood with floral work that gives an elegant and traditional look (matte finish) to your living room. Consists of 4 Panels each of 72 inches Height and 80 inches approximately Width. This stylish partition separates the living room area from the rest of the house or can be used for separating Pooja Space from the rest of the house. A superb way of improvising your home decor and creating privacy in your living room and bedroom with the Room Divider from Aarsun woods. The room divider is easy to clean and maintain. The elegantly designed divider is trendy with fabulous designs and made of Fine Mango wood. Add a classy feel to your living room. A number of designs available in Fine mango wood. Can be customized as per your requirement. Contact us in case you need any other size or design. Time to manage your room space with this classic room divider / partition screen, this charming screen has four foldable panels. 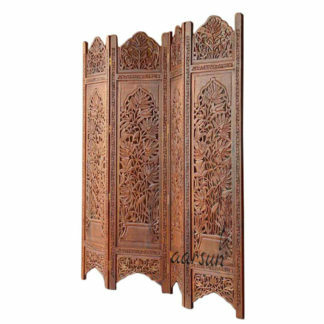 This room divider has antique appeal to it, crafted with finest quality wood this room divider will remain in pristine condition for years to come. This screen has elegant caramel and brown color with distressed finish, the intricate carving makes it look more exquisite. This Wooden room divider can be used in living room, bedroom, drawing room it is functional piece of furniture which will help you divide the room space according to your needs. This wooden Room Divider is perfect for classic or vintage themed home decor, it is light weight and easy to move from one place to another. This screen will give your room space structure and work great in small apartments or studios. This screen is durable and sturdily constructed, easy to maintain just clean it with a dry cloth at frequent intervals and nothing more.